The Walter Camp Football Foundation has announced the Football Bowl Subdivision National Offensive and Defensive Players of the Week, presented by Generation UCAN, for games ending September 15. True freshman Alan Bowman completed 43-of-59 passes for 605 yards and five touchdowns as Texas Tech defeated Houston, 63-49. Bowman’s 605 passing yards set a Big 12 record for freshmen. With the win, the Red Raiders improved to 2-1. Notes: Alan Bowman is the sixth Texas Tech player to earn Walter Camp Player of the Week honors since 2004, and the first honoree since former Red Raider quarterback Seth Doege (Oct. 23, 2011). 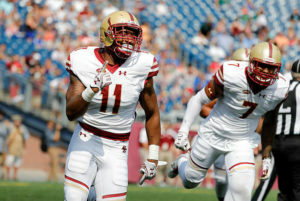 Defensive end Wyatt Ray set a school single-game record with four quarterback sacks as Boston College earned a 41-34 victory over ACC-rival Wake Forest. Ray also recorded a career-best eight tackles and had one quarterback hurry as the Eagles’ improved to 3-0, their best start to a season since 2007. Notes: Wyatt Ray is the sixth Boston College player to earn Walter Camp National Player of the Week honors since 2004, joining current teammate A.J. Dillon, who was recognized on Oct. 15, 2017.